When I think of things German, this is a word that often comes to mind. I’ll bet I’m not the only one, as it seems like a common notion to associate precision with things German. It was also one of the words which came to mind in describing this wine, largely due to the laser-like precision with which this wine attacks the palate. I don’t remember what I paid for this wine, but I do remember it was under $20. 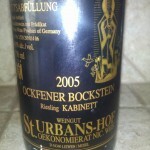 While you can’t buy the 2005 St. Urbans-Hof Ockfener Bockstein Riesling Kabinett, you can buy current releases for under $20 still. I can’t believe how good a bargain this was and continues to be. As with most German Rieslings, the labeling can be a bit cumbersome. I won’t get into an extended lesson, but in short St. Urbans-Hof is the producer,Ockfener Bockstein is the vineyard, Riesling is the grape and the ripeness of the grapes when picked falls into the Prädikatswein classification of Kabinett. I find these to be the best wines for overall food pairing, with Spätlese being my favorite to pair with spicy cuisine. Another wonderful element of German Rieslings are the low alcohol levels. This particular offering came in at a very moderate 9.0% ABV. A lot of folks can find Riesling to be too sweet for their palate. I have tried explaining how a little sugar in wine is fine, especially where the acidity is high enough to support the “weight” of the sugar and keep it from being cloying or dominant. This wine has acid in spades and a large part of the reason the word precision comes to mind. This wine smelled of stone fruits with a touch of bright citrus and a waft of petrol, but in that way only German wines can do well. On the palate, it was more citrus, slate and less on the stone fruit, but was a gem of a wine, doubly so with the Thanksgiving meal it was enjoyed with. I wish I’d bought more of this to both drink now and age, as this still has at least another 7 to 10 years of life ahead of it. Overall, I have to say I really enjoy St. Urbans-Hof as a producer. Their basic QbA is a consistent winner and outstanding value, but this Ockfener Bockstein was superior in every way. A label I’d trust on any purchase. Until next time…live well, love much and drink great wine.